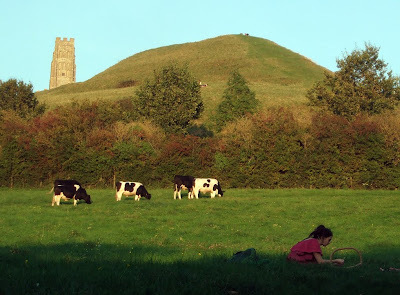 Looking back through the photos I took this summer, I came across this picture of a girl weaving a dreamcatcher in the field below Glastonbury Tor on a sunny day. Dreamcatchers are supposed to help us hold onto our happy dreams and keep nightmares away. Now that the days are cold and the nights are long and dark, a photo like this can keep our memories of summer safe and, like a dreamcatcher, help us dream of a bright future and the springtime to come.